PanPastels are a new way of applying pastels to a surface. They are produced by the Colorfin company. PanPastels consist of artist quality pastel material in cake form, much like a watercolor pan. 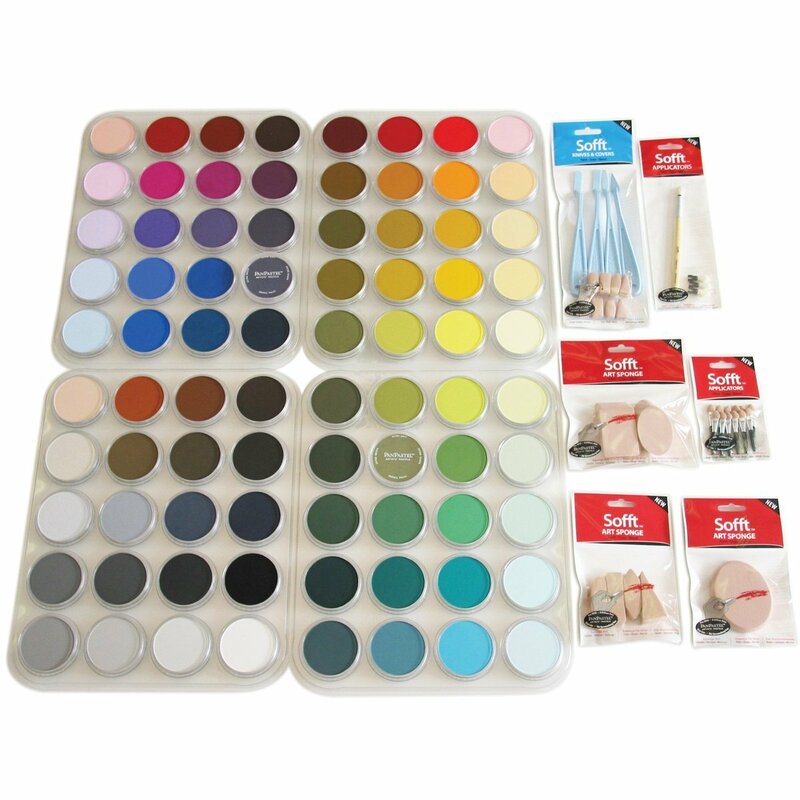 The pans allow the artist to "pick up" the color using specially designed applicators and apply them to the surface in manner that is more closely related to the process of painting. Traditional pastels are manufactured (or made) as sticks, which makes applying them to a surface easy and direct. The process of applying traditional pastels is very much a "drawing" process since the medium is applied dry and applied through various mark-making approaches. Despite this, pastel "drawing" has long been considered a painting process, since the finished result resembles a painting. The approach to color and mixing is very similar to that as painting as well. PanPastels offer the artist a new way of approaching pastel "painting" by offering an application technique that is closer to that used in painting. So PanPastels are not a new medium per se, but rather a new way of applying pastels. Colorfin manufactures an assortment of "applicators" or "brushes" that can be used to apply the pastel to the surface. These applicators are called "Sofft" knives or Sofft applicators. The knives, made of plastic, resemble a painting knife, but have tips that are similar to brushes. Depending on the knife used, the tip mimics the marks made by a filbert, flat, or round brush. Spongy applicator tips are used to cover the tips and apply the pastel to the drawing surface. These tips can be cleaned with a dry paper towel or exchanged out when they become worn or completely soiled. While there are plenty of benefits to using PanPastels, I've found that an added benefit is the forced "loosening" that occurs in the mark-making. As an artist, I am stiff and rigid at times when I create. Using the PanPastels forces me away from this and makes me consider the mark - more so than I normally would. This leads to looser paintings which might be something that you are striving for in your own work. This approach is evidenced in the tutorial that follows in which my technique to using the medium loosens as the painting progresses. I start considering the mark as I make them, deliberately trying to "find" the simplest, yet most effective one to make in the image. The background is addressed first using a mixture of various amounts of blue and white and applied using a large applicator and a round Sofft knife. With the sky complete, work continues on the middle ground, blocking in mixtures of green, blue, black , and yellow. Colors are layered as they are observed in the reference. Some locations of arbitrary color are added to create variety and interest. 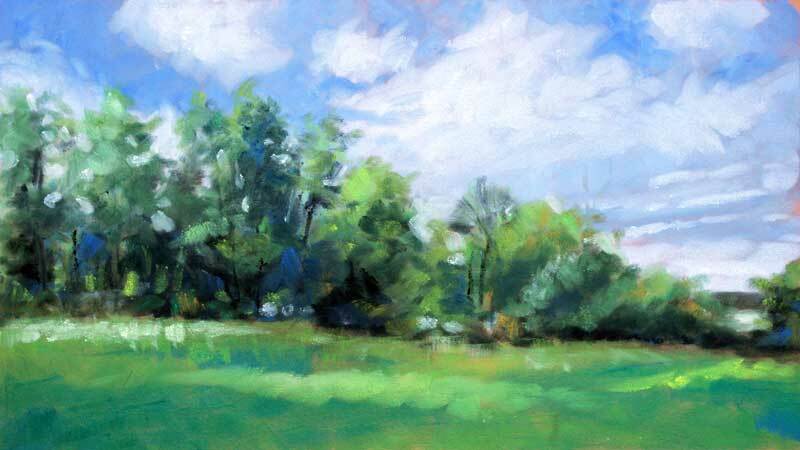 The foreground is layered over the middle ground with various mixtures of green, highlighted with yellow and white. The completed image is loose and leaves the impression of brushstrokes much like a painting.